So much yarn, so little time. : Winnie the Pooh giveaway! 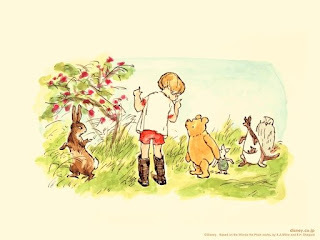 Winnie the Pooh was a favourite of mine as a child, and my own children were brought up with the "real" Winnie the Pooh, not the Disney version. We went to play Poohsticks in the Ashdown Forest at the original location. Even Disney has its good points though - like this personality test! Leave a comment telling me which character you are most like (you don't need to use the Disney test if you already know) and you will be entered into a draw to win a brand-new CD of Winnie-the-pooh read by Alan Bennett (it was a freebie with the Guardian recently). I will use random.org to find the winner on Friday - and to start you off, I think I'm a mix of Pooh and Eeyore, I bounce between being happy and enthusiastic to occasional bouts of feeling everything I do is bound to fail...oops, I used the word bounce, didn't I? There must be some Tigger in there too! I thought I would post here today as everyone beat me to commenting on your last post after your twitter appeal. Your blog is great. Almost no one comments on mine ever except for the giveaway I had. Don't enter me because I already have it - I can recommmend it though! I gave it to my youngest (aged 11) - he sniffed and said he was too old. Then last weekend he wasn't well and I found him tucked up in his spare bed (having been sick all over his own..) happily listening away. A miracle cure! Well according to the test I'm like Rabbit - pernickity and precise! It's probably fairly true. I do like things to be organised and neat and tidy. oh that personality test was fun, it says I'm a Pooh, I like the description. My 9mth old loves Pooh & Tigger! Did the personality test and I am Rabbit!! hahaha....prescise....thats me! hahaha. My blog is new and no one ever comments on mine! Happy knitting......can hear the needles from here! I'm pooh, of course, round and absent-minded! i thought i was a pooh or eeyore but turned out i was an owl. sounds about right! I just did the test and I am a Tigger-I don't think I have quite as much energy as him though! I am Tigger for sure, no test needed. I follow your wonderful tweets! It seems I'm Pooh too! And I was pooh! 6 year old then said "is that because you are fat like pooh?" *sigh* time to get the Wii Fit out I think! I love Pooh! I love Pooh! I love Pooh! My favourite is Pooh. He's so adorable. Apparently I'm piglet. I disagree. Eh, oh well. This competition is now closed. Random.org is finding me a winner.